Japan scrum-half Atsushi Hiwasa has been awarded the inaugural Asian 5 Nations Emerging Player of the Year award. The Suntory Sungoliath half-back has enjoyed a fantastic season that saw him win his first two caps for Japan having been named the Japanese Top League's Rookie of the Year. Hiwasa is currently in contention with Fumiaki Tanaka for the Japanese scrum-half berth, but competition for places is no new challenge for the 24-year old who previously vied for the starting sport at Suntory Sungoliath with Wallabies legend George Gregan. Hiwasa was delighted to win the new award, created to recognise new or emerging players in Asian rugby, and hopes to be selected in John Kirwan's 30-man squad for the Rugby World Cup. "It is a great honour for me to receive the HSBC Asian 5 Nations Emerging Player of the Year award," Hiwasa said. "I have a strong determination to maintain my good performances, and in doing so I hope to contribute to the development of Japanese rugby and Asian rugby as a whole. As the winner of this award and a representative of the Asian rugby family, I will continue to do my best to be selected to the Japan squad for Rugby World Cup 2011." Japan coach Kirwan praised his scrum-half but insisted he will need to maintain this high level of performance to realise his goal of being selected for the World Cup. "Hiwasa is one of the most outstanding and promising young players in the national team squad," Kirwan said. "In the recent HSBC A5N tour and domestic training camps, he has dramatically improved his performance level. I look forward to his continued hard work and higher performance to be selected for the Rugby World Cup squad." Hiwasa was chosen to receive the award by a voting panel consisting of local journalists and representatives from HSBC including former Scotland coach Frank Hadden. 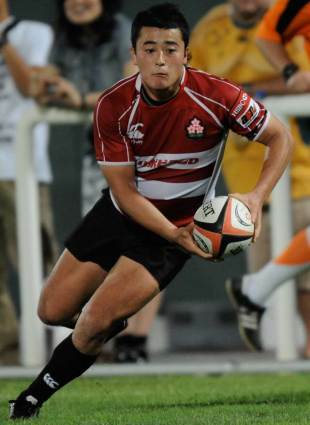 Rich Freeman, correspondent for Japanese newspaper Daily Yomiuri, spoke of Hiwasa's tussle with Gregan for the Suntory starting berth saying: "Hiwasa not only kept Gregan out of the starting line-up but played a major role in Suntory reaching the Top League final and winning the All-Japan Championship.